Mabel & Gladys - Allen Bailey & Associates, Inc. 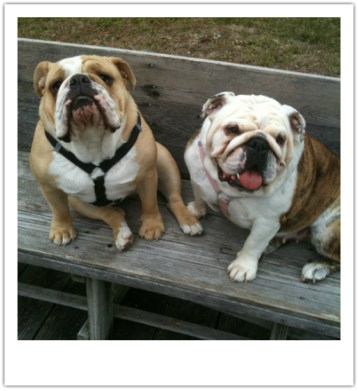 The AB&A “Bulldog Mentality” began with our firm mascots, Allen’s late pet English bulldogs. They could very well have been named “Desire” and “Determination”, instead of “Mabel” and “Gladys”. If one of these bulldogs saw something they want, you might as well just give it to them. It might be your shoes, it might be your briefcase, it might be a ball….whatever it is, once a bulldog sincerely desires something, the determination exhibited to acquire that desire is unbelievable. Here at AB&A we strive to exhibit that same tenacity on a daily basis. In fact, bulldogs were initially bred for tackling bulls. They have strong jaws and teeth for grabbing a bull by the neck and hanging on. In short, Bulldogs are not afraid to go after big things, just like our counterparts at AB&A. The American Kennel Club describes the Bulldog as being equable and kind, resolute and courageous with a general appearance and attitude that suggest great stability, vigor, strength, and dignity. This description resonates to the core of our team here at AB&A.